Ghost Talker, the fourth novel in the Ghost Seer series, finds Clare and Zach trying to solve the problem of a poltergeist disturbing Buffalo Bill’s grave. Robin D. Owens has done a good job of evolving the psychic abilities of these two characters, as well as increasing the depth of feelings between them, so that the relationships continuing storyline is moving forward. Nothing makes a reader more mad than a stagnating romance, and this one is anything but standing still! The following synopsis is taken directly from Amazon.com. 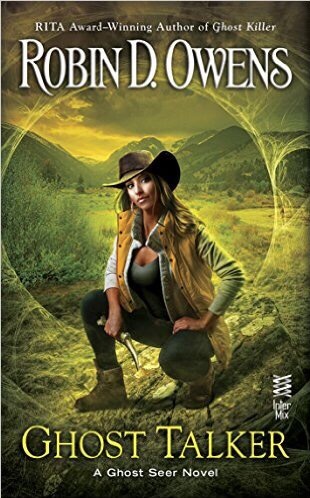 Clare’s psychic abilities are confined to being able to speak to ghosts from the Old West. In this book, she uses an old west ghost as a conduit of sorts to help she and Zach solve what turns out to be a current problem. Zach puts his sleuthing abilities to work, and takes a larger role in this book, in solving the mystery, than he has in the past. I liked that change, as it puts their relationship on a more even footing, which I think it needed, to make their feelings more believable. The good versus evil theme, didn’t just play out in the Old West. They had a real life antagonist to protect themselves against, which forced Clare to make a decision about her life as a psychic. Would her psychic life remain private, or would she have to out herself? Clare and Zach are opening up about their feelings, and their psychic abilities seem to have a more permanent foothold in their lives. In fact, they both seemed to have gained a few more! If you have read the other three novels in this series, you will enjoy the fourth and will be looking forward to the next!